TSPSC Town Planning and Building Overseers Recruitment 2015, Telangana TPBO Recruitment 2015, telangana state public service commission latest Recruitment news 2015, Tspsc official website is www.tspsc.gov.in, TSPSC latest Notification, recruitment. 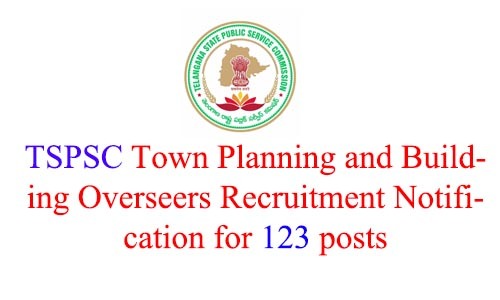 TSPSC Town Planning and Building Overseers Recruitment Notification 2015 is issued for 123 Town Planning and Building Overseers in Municipal Town Planning Subordinate Service Vacancies. TSPSC Town Planning and Building Overseers Recruitment Notification is officially announced today at TSPSC Official webiste. Eligible and interested candidates need to apply online for TSPSC TPBO Recruitment 2015. TSPSC TPBO Online Apply process starts from September 23, 2015. For More details like last date, fee,….etc mention below. Applications are invited Online from qualified candidates through the proforma application to be made available on Commission’s WEBSITE (www.tspsc.gov.in) to the post of Town Planning & Building Overseers in Municipal Town Planning Subordinate Service in the State of Telangana. 2. The Examination is likely to be held on Dt. 22/11/2015. The Commission reserves the right to conduct the Examination either COMPUTER BASED RECRUITMENT TEST (CBRT) or OFFLINE OMR based Examination of objective type. Before applying for the posts, candidates shall register themselves as per the One Time Registration (OTR) through the Official Website for TSPSC. Those who have registered in OTR already, shall apply by login to their profile using their TSPSC ID and Date of Birth as provided in OTR. Minimum 18 years & Maximum 44* years. The age is reckoned as on 01/07/2015 (Rule- 12(1)(a)(v) of State and Subordinate Service Rules). After provision of the relaxation of $ge in Col. No. 3 of table above; the age shall not exceed the maximum age prescribed for the post for the candidates at Sl. No. 3 & 4. The age relaxations for Ex-Servicemen is applicable for those who have been released from Armed Forces otherwise than by way of dismissal or discharge on account of misconduct or inefficiency. (Remittance of Fee) Each applicant must pay Rs. 100/- (RUPEES ONE HUNDRED ONLY) towards Online $pplication Processing Fee. This apart, the applicants have to pay RS. 80/- (RUPEES EIGHTY ONLY) towards Examination Fee. However, the following category of candidates are exempted from payment of Examination fee. N.B. :- BC’s, SC’s and ST’s belonging to other states are not exempted from payment of Examination Fee and they are not entitled for claiming any kind of reservation. The fee once remitted, shall not be refunded or adjusted under any circumstances. Failure to pay the examination fee, application fee, wherever applicable will entail total reMection of application. The list of Banks providing service for the purpose of online remittance of fee is given in ANNEXURE – II. More Details About CENTRES FOR THE WRITTEN EXAMINATION, How to apply, General provisions, and more available at TSPSC TPBO Notification which is given below.